Because customers are thinking in terms of experiences, brand consistency must be delivered across all touchpoints. And because experiences themselves are intangible, it’s vital that companies develop mapping techniques to bring these experiences to life. Traditional markets are being disrupted by e-commerce, IoT, and circular economy trends. As a result, customers of products and services in these markets are seeking more connected experiences that cross traditional industry borders. Now, seamless (and desirable) customer experiences are required to satisfy primary needs while also providing additional values and delighters. Companies are facing the need to deliver experiences through multi-layered solutions that consider various stakeholders across many channels and touchpoints. Because customers are thinking in terms of experiences, brand consistency must be delivered across all touchpoints. And because experiences themselves are intangible, it’s vital that companies develop mapping techniques to bring experiences to life. At Essential, we believe that a collaborative and interdisciplinary approach is the key to success in the competitive market. This approach combines macro-level understandings, such as the eco-systems that businesses work within, as well as micro-level insights such as individual’s needs and desires. Combines the creative nature of information design with the strategic perspective of business and the analytic perspective of research. Supports a layered structure, which illustrates the complexity of a project with all the associated entities bringing a shared understanding among the team members. Captures and communicates a range of data from explorative to prescriptive and enhances the level of engagement and investment among an audience. 1. Frame a structure: The first step is to clearly define your goals: What is the purpose of the map and what are the boundaries of its scope? In which phase of the project will it be leveraged? Will it be a physical or digital model? What are the dimensions that best suit its use? What should the level of fidelity be? How macro or micro are the details? For example, are you capturing daily interactions of a customer with a company or are you trying to understand how multiple components come together to support those interactions? Your map will be viewed and analyzed through these filters; ideally it will support decision-making because it’s created a shared understanding about the specific types of information and layers required. 2. Arrange layers to communicate a theme: Service models are typically layered models because they must accommodate many users’ unique needs. What layers are necessary? How will they be viewed through your chosen filters? What information should be included or excluded? Actions, thoughts, emotions, processes, physical evidence, time periods, places, channels, and relationships are examples of popular layers. The key is to capture the essence of each layer and illustrate meaningful insights, making sure every aspect of the experience contributes to the overall purpose and story. 4. Show connections: Big ideas need to be communicated simply. Great visuals attract attention and tell a story. How can you transform large amounts of information into a digestible, aesthetically pleasing, and factual visual form? The granular details should illuminate the most powerful ideas within a hierarchy of information that engages your audience. Use scale, typography, contrast, and color to create hierarchy and legibility. This principle directly relies on a creator’s analytic, strategic, and creative skills and affects the richness of a map. Creating a cohesive and comprehensive map is not simply about visualizing information, but is about uncovering patterns to build meaningful stories. What are the differences among customers? Where are the clusters of pain points or satisfactions? By framing the data at broad and detailed levels, we can connect dots and build comprehensive maps. 5. Build empathy: Mapping experiences is about people (not data points). 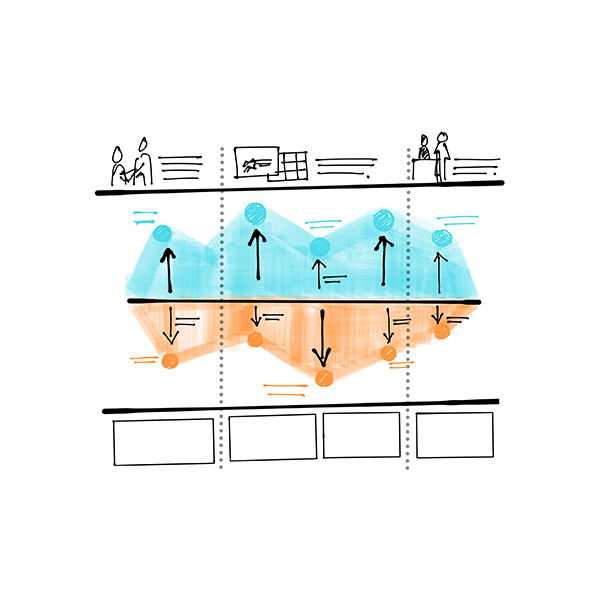 Ground your visual model in research and communicate information through customer perspective. Your understanding of needs, attitudes, behaviors, and underlying motivations must be expressed to create a connection with your audience. In fact, your empathetic view also applies to your audience: appreciate their needs, learn about their level of knowledge, understand their expectations, speak their language, and facilitate the process of embracing your visual model. How can you bring transparency to the data? How can you evoke emotions? What are the familiar and established data points, perspectives, and initiatives that you can borrow to enrich individuals’ connections? 6. 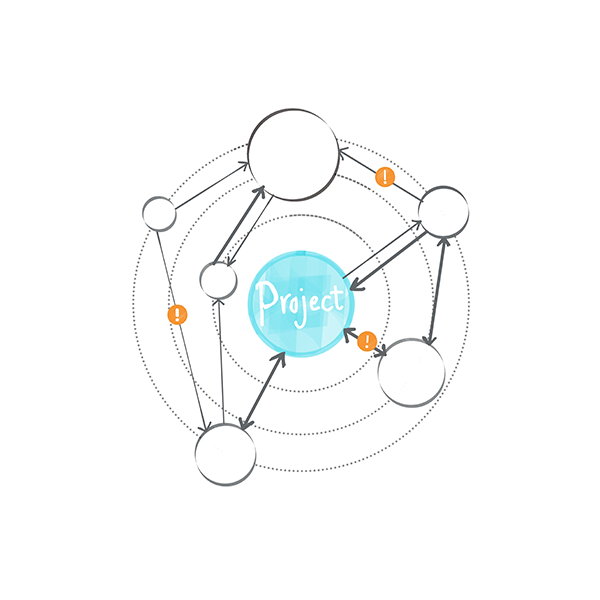 Create value and inspire actions: Finally, consider your visual model as a catalyst that can raise awareness and highlight drivers for the next phase of a project. It is a strategic tool that makes the invisible visible. Illustrating and igniting productive discussions around realities of a customer’s life can bring new solutions to life. Analyze your data to reveal insights, critical moments, and calls-to-action that are valuable to customers and profitable to business. What are the takeaways and steps toward change? How can you build visions? What are the opportunities to improve customer relationships and increase their engagement level with the business? A systems map is a living document with the purpose of gaining a broader understanding of the context surrounding a solution. For example, a “stakeholder” map illustrates all entities within a system, their attributes, and value exchanges. A “customer lifecycle” map is another example for analyzing people’s experiences with an industry or a company through four stages of human, consumer, customer, and user depicting what influences their decisions and behaviors. A customer journey map communicates a rich understanding of customers’ behaviors and how they interact with a company. It also supports generating ideas for the before, during and after-purchase phases, covering end-to-end experiences. It visualizes a persona’s step-by-step actions, thoughts, and emotions with touchpoints, and provides a strategic direction and opportunity areas for creating an ideal journey. 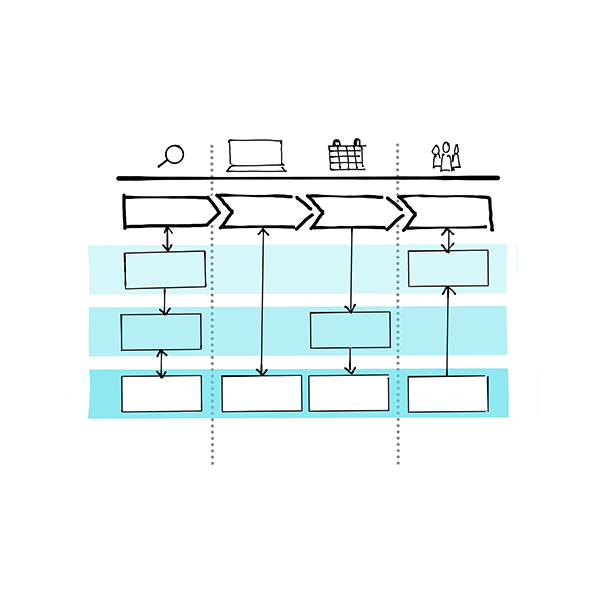 An experience map follows the same model as a customer journey map and captures end-to-end customer experiences; however, it takes the visual model one step further and illustrates a more holistic view of individual’s daily life or life chapters. It provides a foundational knowledge that illuminates how the solution or a company fits into the broader context. It uncovers the detailed view and structure of experiences, such as the nature of a customer’s actions and expectations, emotional goals and triggers, and contextual pain points. An experience map reveals rich insights through highlighting key points within a journey that can create more meaningful and valuable experiences. A blueprint is a strategic map for creating excellent customer experience and seamless service delivery. It aligns goals and expectations with frontstage touchpoints and backstage supporting resources, processes, and systems. 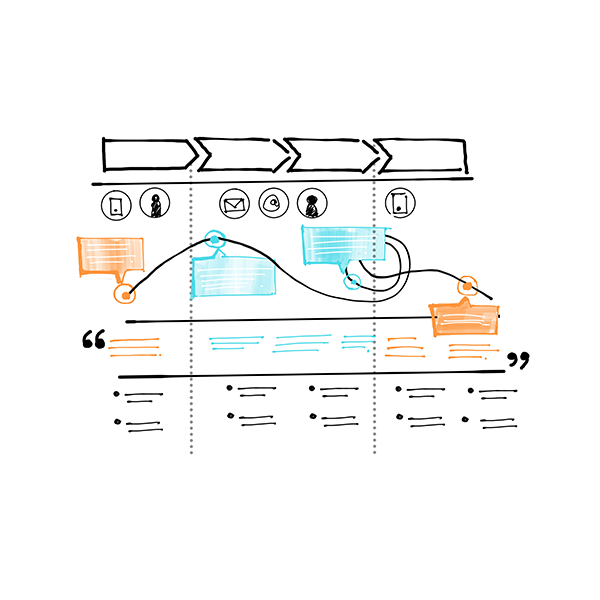 It supports a team to design and orchestrate components of a solution as they unfold over time. 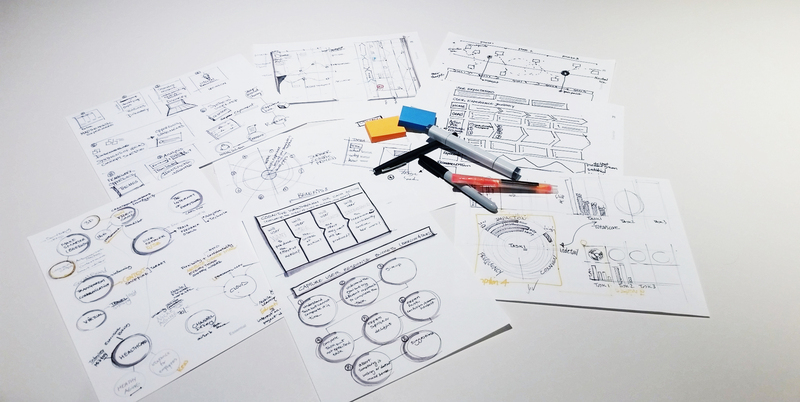 Blueprints provide a holistic and detailed view for different departments to understand their contributions in bringing experiences to life in relation to the bigger picture. While every situation is unique and every project is different, all situations and projects benefit from good visual communication. The options presented here, and the principles behind them are ones we use to suit the needs of the teams with whom we interact. We hope this perspective helps you think about how you might map your findings and their implications. If we can clarify our intent or their usage further, please connect with us at newbusiness@essentialdesign.com.